Photo Credit : Photography by Ari Hatzis. Drawing inspiration from the name “Kitty Burns” based on the history of the iconic Skipping Girl, we visualised a character with split personalities and worked this into our design - Kitty being the more playful of the two while Burns executed discipline and severity. Our design studio is a full-service creative design consultancy, specialising in crafting Interiors, Buildings and Products for our clients. We focus on the delivery of sound design and quality assurance, supported by strong technical knowledge throughout a projects lifespan. 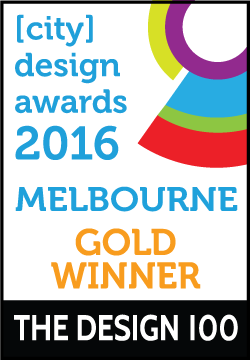 The studio is based in Melbourne and operates internationally as a collective of designers, architects and consultants. Our commitment to new challenges allows us to take a holistic approach every time. With extensive practical understanding towards residential, hospitality, commercial, retail, workplace, installations and products. We believe in design’s power of expression through meaningful design and architecture with timeless qualities. 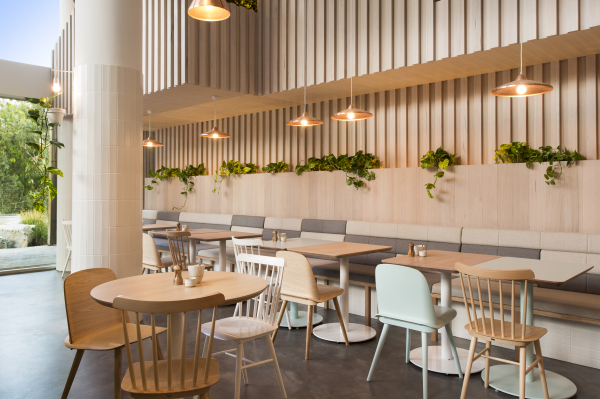 Nestled below Melbourne’s iconic Skipping Girl, our design studio saw an opportunity to give Kitty Burns a dual personality, resulting in a space that capitalises on contrast. 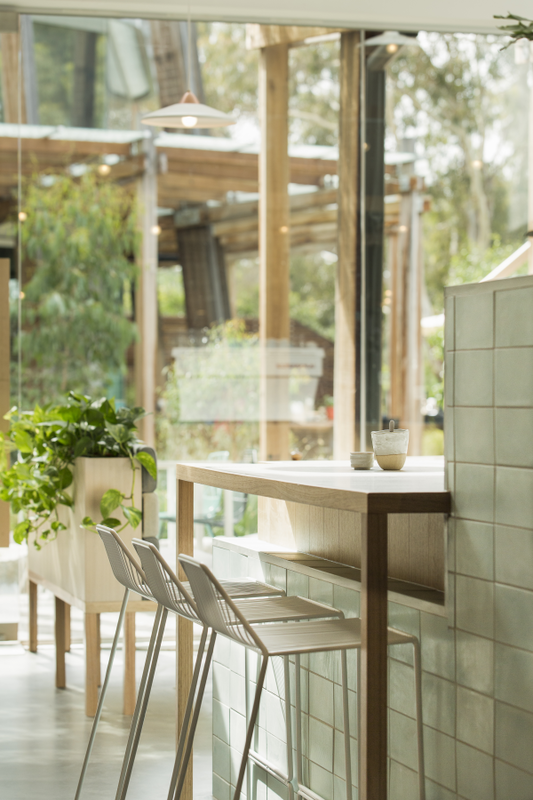 With an aim of creating a space that would feel homely to the residents of the apartment complex, we introduced a pitched roof design into the space, embracing natural light and choosing design elements that would complement, the surrounding Yarra Bend. We played on an idea of Kitty having a playful side while Burns was the more disciplined of the pair, a contrast reflected in every element of the design-pale turquoise tiles are contrasted with strong overhead structures, while clean the lines of pitched roofs are arranged at varying heights to create a similar feeling of juxtaposition. Fusing mischief with structure, frivolity with discipline, Kitty Burns embodies the iconic Skipping Girl woman in one light-filled space. 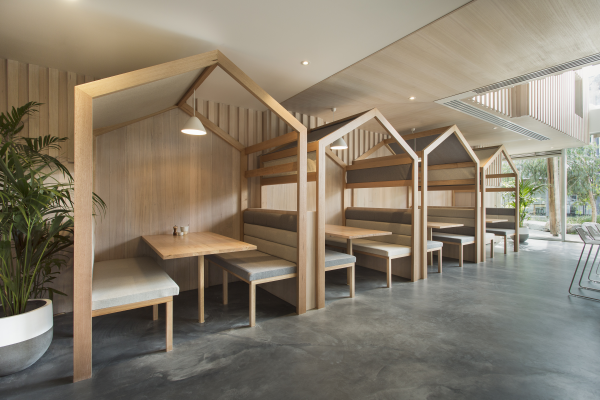 Our studio wanted to establish Kitty Burns as a home away from home for the residents of the Haven apartment complex, a pitched roof design was introduced and incorporated into all elements of the project. We played with both scale and displacement of the roofs, forming a 3D effect that we utilised to create intimacy throughout the various dining spaces. The home concept was also carried through into the brand identity we created for Kitty Burns. The Skipping Girl story provided Kitty Burns with a name, while our studio created a dual personality for the brand. The contrasting elements of the Kitty Burns personality are creatively woven into every design element- Kitty’s fun loving, playful personality, juxtaposed with Burns’ more serious and structured side. Challenges presented themselves in the shape of pre-existing 6 metre high ceilings. We took this as an opportunity to capitalise on stunning natural light and open space while ensuring a level of intimacy was maintained. To maintain this, we designed three dining areas to break up the space, creating unique dining experiences that work together cohesively. These pitched roofs also played on the Kitty vs Burns theme - where Burns brings in the physical structure and clean lines, closer inspection reveals that each pitch is at a different height, paying homage to Kitty’s playful side. 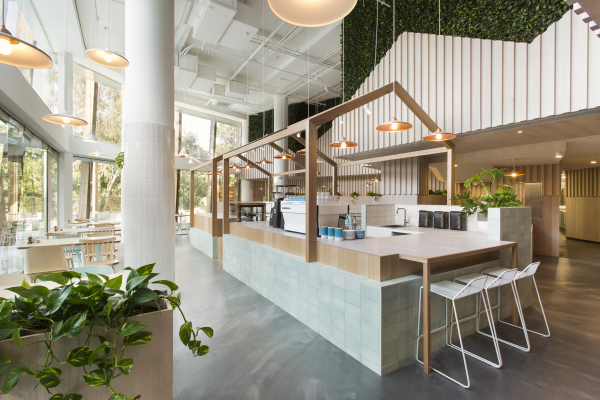 The challenge of servicing two main areas of the bar - was to create a coffee bar and a elixir bar, individually housed within framework that ensures each area is distinctly identifiable, aiding on a practical level with ordering and service. 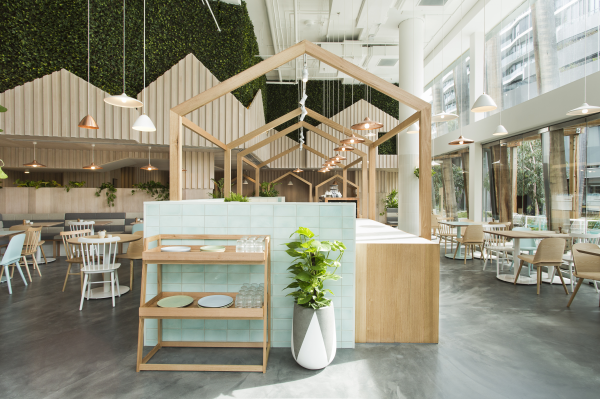 The bar is lined with handmade pale turquoise tiles, a nod to Kitty’s more playful side, framed by a strong overhead structure constructed from Australian natural timbers, representing Burns’ more disciplined personality. 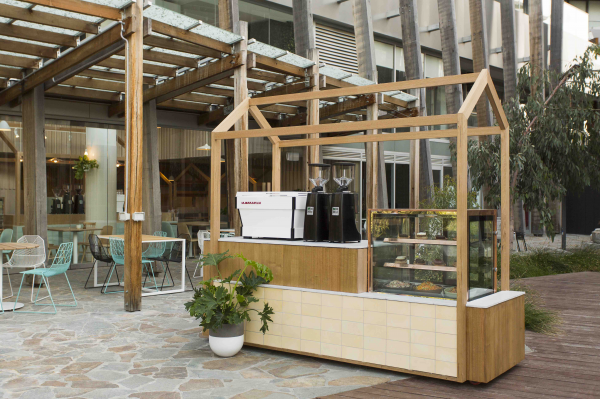 Within the coffee bar we have introduced a waiting area for patrons, as well as designing a mobile coffee cart that echoes the design language of the main bar. 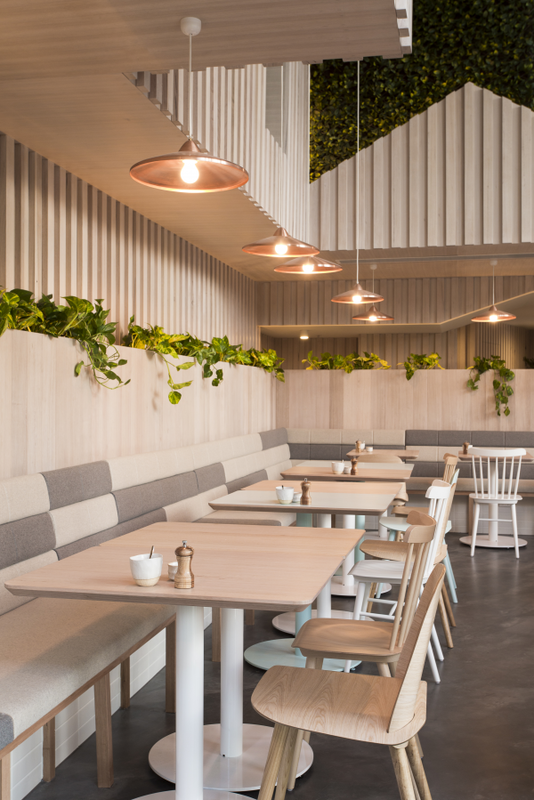 The lime washed timber bulkheads forming the house shape above the dining areas are lined with three-dimensional cladding detail, allowing natural light to create a shadowing effect changing the colour of the timber depending as it receives light. 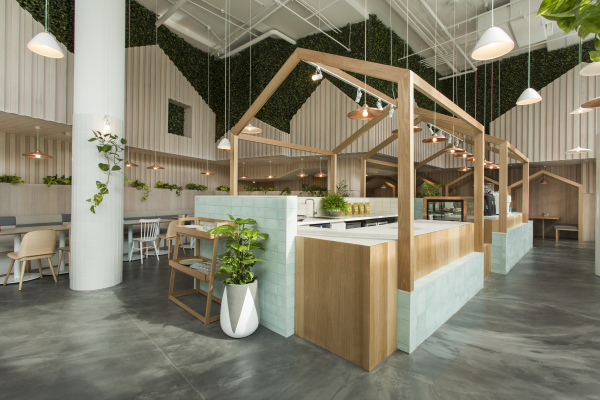 In contrast, the lime washed walls along the seating pods and bar take on a more natural stain allowing these elements to be highlighted within the space with a hierarchy in design and areas of focus. 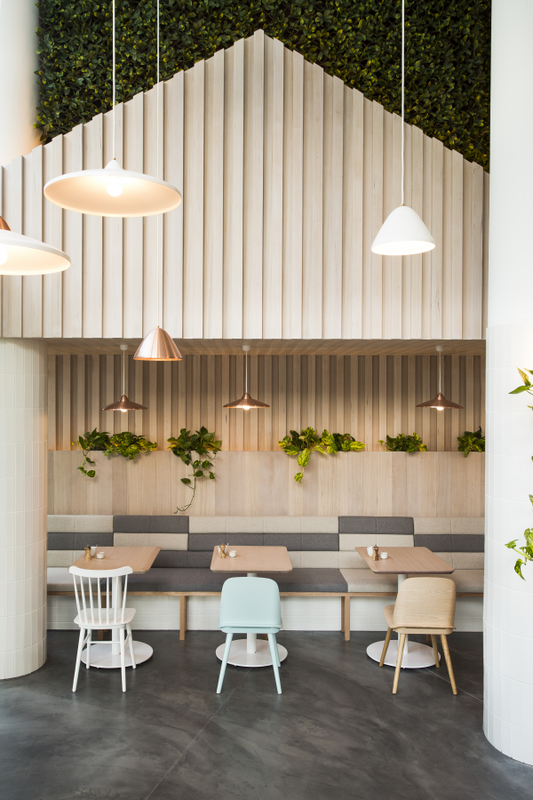 With the tranquil surroundings and views of Melbourne’s iconic Yarra River, it was of the utmost importance that our design studio took advantage of that tranquility to create comfort and a sense of serenity. 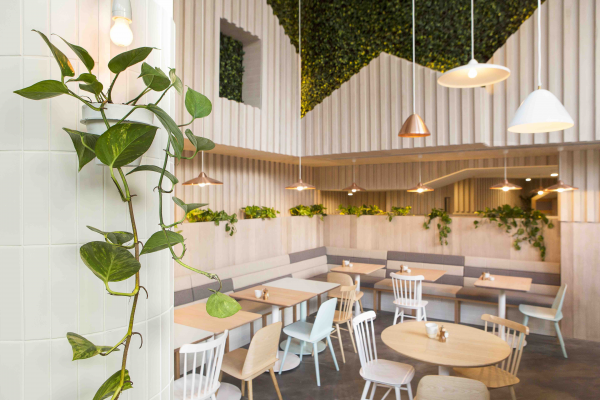 We introduced a strong element of greenery inside to embrace the surrounding, making the dining spaces feel one with the environment. The space doesn’t compete with the external surrounds, instead complimenting it.